Blukolado is a two column blogger template with sidebar to its right and post section to left.The theme is designed by simplywp and converted by me to blogger.The design is simple and looks very nice.Top menu links are ready for you.Rss and twitter buttons are also ready in sidebar of the blog with search bar ready.Seo for title has been done in template.I hope you will like the template for sure.Template support full blogger features.Four column footer is also built to add more widgets. 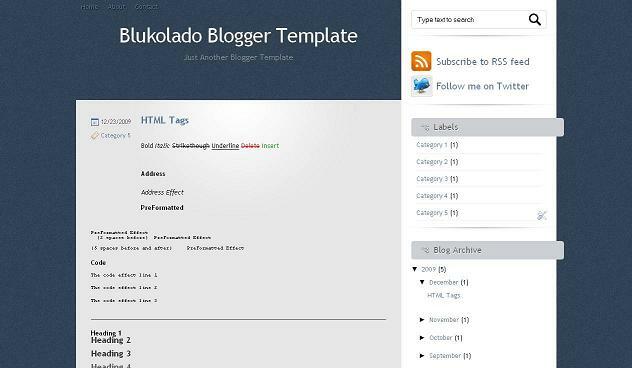 Other blogger templates you may like are Masugid and Kodzilla. Replace # with links and text with your linking text. Find for below link and place your twitter profile link. Nice and cool blogger template but included more powerful widgets. Thanks.